In a world where everything is typically over-sized, large and exuberant, there is a movement towards the exact opposite – Miniature. This site will walk you through some of the different trends in the world of all things small. Miniature houses are commonly referred to as small houses or Tiny Houses. This movement is relatively self explanatory. There is no definition as to what makes a small house, but some are as small as forty-six square feet, which is extremely small compared to a typical house. There are no sacrifices in the quality or personality within these tiny houses. And they can still have top of the line appliances, room for sleeping and eating and smart storage. 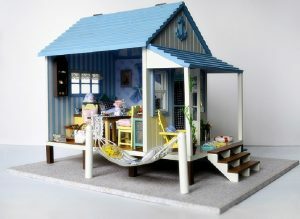 Miniature houses and buildings are another common form of small scale items. Miniature cities, miniature buildings, and small houses, are used for hobbies, and also as scale models when developers are looking to present new developments and building proposals. It offers a great way to show how a building fits within a certain landscape.